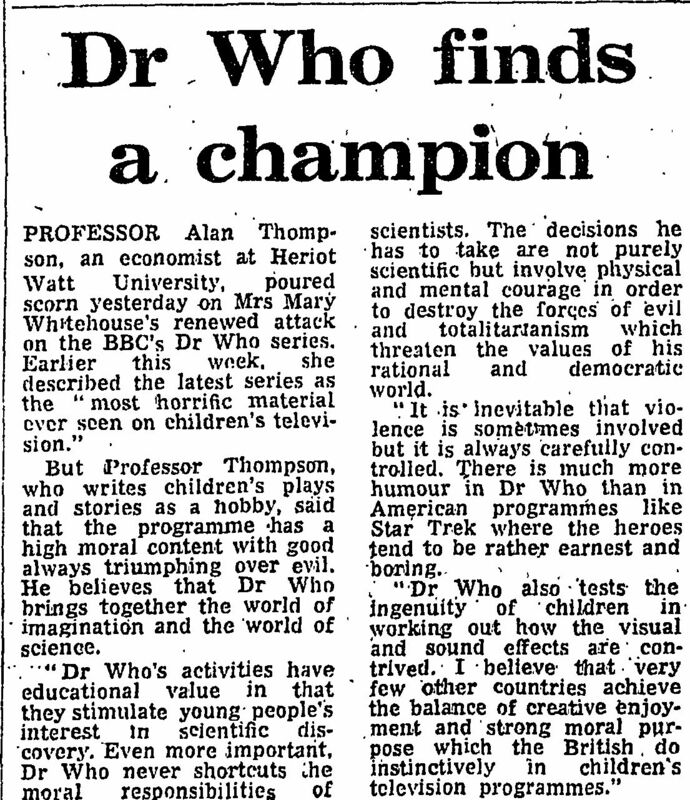 PROFESSOR Alan Thompson, an economist at Heriot Watt University, poured scorn yesterday on Mrs Mary Whitehouse's renewed attack on the BBC's Dr Who series. Earlier this week she described the latest series as the "most horrific material ever seen on children's television." But Professor Thompson, who writes children's plays and stories as a hobby, said that the programme has a high moral content with good always triumphing over evil. He believes that Dr Who brings together the world of imagination and the world of science. "Dr Who's activities have educational value in that they stimulate young. people's interest In scientific discovery. Even more important, Dr Who never shortcuts the moral responsibilities of scientists. The decisions he has to take are not purely scientific but involve physical and mental courage in order to destroy the forges of evil and totalitarianism which threaten the values of his rational and democratic world. "It is inevitable that violence is sometimes involved but it is always 'carefully controlled. There is much more humour in Dr Who than in American programmes like Star Trek where the heroes tend to be rather earnest and boring. "Dr Who also tests the ingenuity of children in working out how the visual and sound effects are contrived. I believe that very few other countries achieve the balance of creative enjoyment and strong moral purpose which the British, do instinctively in children's television programmes." APA 6th ed. : (1976-01-28). Dr Who finds a champion. The Guardian p. 26. MLA 7th ed. : "Dr Who finds a champion." The Guardian [add city] 1976-01-28, 26. Print. Turabian: "Dr Who finds a champion." The Guardian, 1976-01-28, section, 26 edition. This page was last modified on 20 November 2014, at 03:09.